Some Bearded Dragon Photos - photography and video - Furtopia | Family Friendly Furry Forum and IRC Chat! 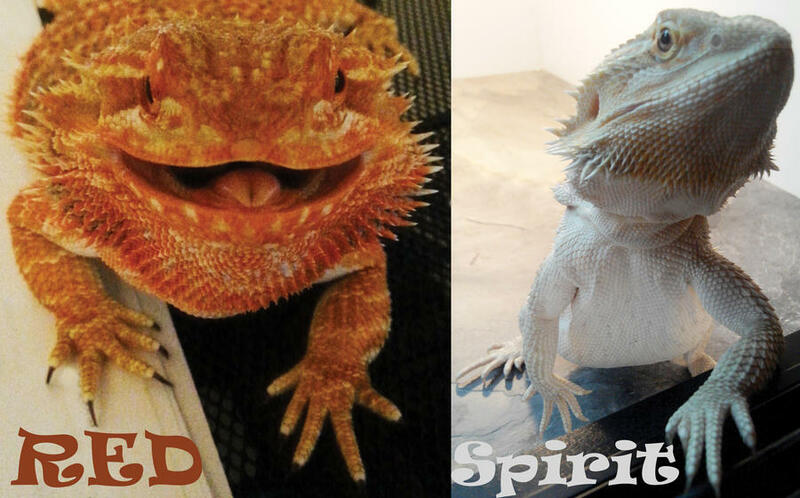 Thought I might post some pictures of my two recently acquired Beardies . Both are around 6 to 7 months old. The one on your left with the piece of veggie on its chin is (Red) a Leatherback and the one on your right tilting its head at the camera, possibly trying to say "You see what I have to live with? ", is (Spirit) a Hypo Citrus Tiger. i have my own dragon too! They are really cute . Also very curious, due to their young age I think, they still tend to try and jump off my shoulder when they see something that catches their eye. They also scare my two cats, to the point that just me taking the beardies out of their cage causes the cats to run and hide in another room . I believe it's alright for me to remove this thread from the grave, if not I apologize. Anyway my bearded dragons are now over a year old and doing great! Here is a pic of them all grown up.